This rectangular stone stands 1.65 metres high and is 0.67 metres wide and 0.46 metres thick. From the side (see image above) the megalith looks almost pointed. The stone is aligned NNE-SSW. A tree has been planted a little too close to the stone, but hopefully no damage will occur. 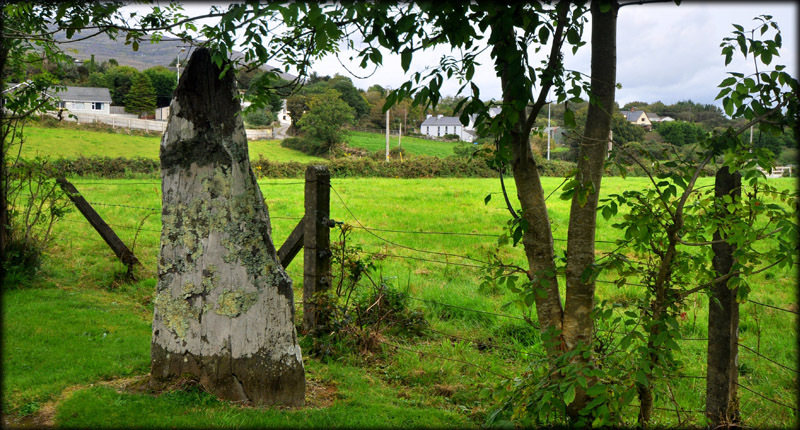 The only other items of interest I know about in this townland are two boulder burials and a large outcrop in a private garden, bearing rock art. Seven kilometres west of here is the wedge tomb at Altar. 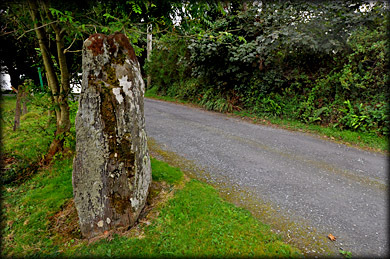 Situated: From Schull go east on the R592. After 500 metres there is a sign for standing stone apartments on your right. The stone is c.50 metres up this laneway. Discovery Map 88: V 9329 3186. Last visit Sept 2012.